In order to cater to the numerous necessities of the patrons, we have been able to provide a qualitative range of Newton Low Cradel. - Newton's Cradle makes a great desktop gift. - These swinging balls will keep you occupied for hours at work. 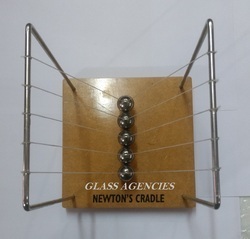 - Newton's Cradle is a clever device that not only demonstrates a pendulum, but also shows the Laws of Conservation of Momentum and Energy. - Base of the product is made of plastic. We provide Physics Experimental Kits that are in great demand in the current market. These comprise of varied projects that deal with all spheres of school physics. There is widespread demand for these amongst school children and we fulfill it reasonable costs. 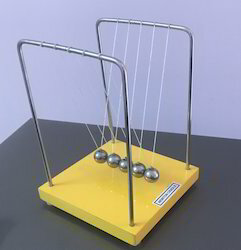 One of the most popular educational toys offered by us is make-a-Newton’s-cradle. This kit comprises components that can be used for making Newton’s cradle, a device that demonstrates conservation of momentum and energy via a series of swinging spheres. Highly demanded in educational markets, this project kit is offered to the clients at inclusive prices.